No League in your community? Start one! You can use the LWV “Member-at-Large” (MAL) Unit process to begin empowering voters and defending democracy in your community! With LWV MAL Units, administrative functions like financial management, by-laws, membership management and incorporating are initially handled by LWVMA, and you will have a mentor to help each step of the way. When you are ready, you can find out what the next steps are to become a free-standing local league. Ask your state League office to find out what’s involved. Review the LWVUS & LWVMA nonpartisanship policy. Review the following: League positions (LWVUS, LWVMA), the guidelines for the use of the name “League of Women Voters” & the Logo. Follow the LWVUS, LWVMA or and other local Leagues on Facebook and Twitter. Become familiar with the communities other Massachusetts Leagues are already serving. 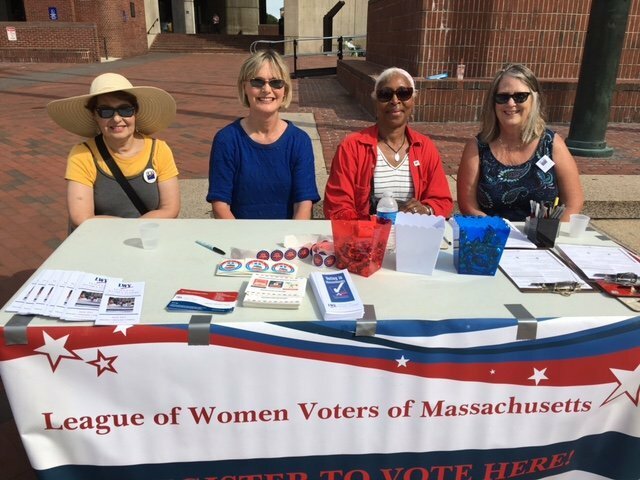 Fill out the “Start a League Interest Form” and contact the state office lwvma@lwvma.org or call (617) 523-2999 to let us know you are interested in forming a new League and get help with any questions you may have. Refer to the starting a new local League document for more information about the process. Find other people who share your interest in starting a new League in your community and ask them to join as a MAL and write in the county, city, or community where your group is starting a League. Watch for a welcome packet in the mail with some helpful “getting started” tips and tools. From this group of people, form a Leadership Team consisting of a president (who speaks for the League) a treasurer, secretary, and other members to handle membership, and voter service. At a meeting of your Leadership Team, share, discuss and commit to the League’s nonpartisanship policy when developing one for your MAL Unit. Vote to seek recognition as a new Massachusetts League through the MAL Unit process. Email these items to the LWVMA office at lwvma@lwvma.org with your request for recognition as a new League. The League of Women Voters of Massachusetts Board will vote on your request and if approved will fill out the LWVUS application for your new League unit! Watch for a welcome packet with some helpful “getting started” tips and tools. Call the state League office at (617) 523-2999 with any questions or concerns that come up along the way. Step 4: Get to work as a new MAL Unit! Share and discuss nonpartisanship and diversity policies and any other necessary LWVMA policies. Decide how you want to divide up the work – assigning roles and tasks to make democracy work© in your community. Follow LWVMA and LWVUS on Facebook and @lwvma @lwv on twitter. Find great content to share and ideas for what you might do. Receive email updates for League leaders with news, reminders and resources. Sign up for LWVUS League Update you can sign up to receive it. Use this form. Set some priorities for the year, with specific ideas about how your League wants to approach membership recruitment, voter education, get out the vote, advocacy, voter registration, and publicity. Build your working calendar for the year around these priorities. Decide how you want to introduce your League and the programs and priorities of the LWVUS and LWVMA to others in your community. Develop a plan to take advantage of leadership training, mentors from other Leagues, the LWVMA board, and League coaches. Grow your League by being visible, doing good work, and inviting others to join! Thank you for making democracy work in Massachusetts!